The flurry of marshmallow activity combined with a little one that has learned to crawl in recent weeks has made for a slow going of holiday decor over here at the Smith Homestead. We decided to forgo the traditional tree because Othniel is in that exact stage of life to pull every decoration off of it every day. Instead Mike chopped down a little spruce tree in his family's hollow this weekend and it has a nice place on the side table. This also meant forgoing many of our traditional ornaments that were too heavy for the little spruce's limbs. Lots of lightweight pine cones, little linen handmade ornaments and handmade mini yarn pom poms this year...I love it. I am slowly accumulating my Christmas village. I scour the thrift stores after the holidays and never spend more than $3 on any given house. Some may find these little houses cheesy, but I adore them. And I am wanting ever so much an enormous (takes up the entire mantle) nativity set that I saw at the vintage store here in town. The $100 price tag is a bit out of my price range, so we'll happily make do with this one I found last year...once again, at a thrift store. How is the holiday decorating coming at your homestead? Its that time of year again. Busy season for The Marshmallows Company. Canaan, who started this little enterprise at age 5 is now nearly 8 and the company is growing by the year. We're already a bit behind schedule with orders but catching up on it all and happy to see all of the orders rolling in. Slowly he is taking on more tasks that are associated with his business. Yesterday he spent some time emailing back his customers. Here was one of the emails he sent. I love the P.S. at the end. This is Canaan. I have peppermint and vanilla. I can just bring them to school. I'll have them ready before Christmas break. Thank you for thinking of me. P.s. i'm really typing this. This whole business thing has been so fun and so educational. Lessons about giving back financially (tithing), realizing that he actually has to work for money, how to budget, buying supplies, paying his employees (i.e. Ezra), setting goals and achieving them, disappointment when orders don't come in as often as he'd like, learning to interact with customers and speak well with adults, and the list could go on and on. So from now until Christmas we will be knee deep in marshmallows...yum. (If you want to get your hands on some of these uber-delicious marshmallows, just click the icon in the right hand sidebar). I Said In My Heart..."I Love My Life"
Last night I started feeling well enough (from this week of yucky flu like symptoms) to clean the house. Really, it was so dirty it should have been condemned by the health department...ok that's an exaggeration but for someone like me who likes a tidy home, it was leaning toward uber-gross. Anyhow, while making my way through piles of dishes I looked onto the ledge of the sink and just had to smile. Immediately I said in my heart, "I love my life". I have these moments often. Sometimes when I am walking in from outside and look through the big picture window to see Mike and the boys cuddled on the couch, I say in my heart, "I love my life". When the boys find 2 of Otto's wet diapers and begin smacking each other and sword fighting with them (as happened just yesterday)...even then I say in my heart, "I love my life". So last night, while doing the dishes, I looked up on the ledge and saw Otto's rubber ducky, Canaan's toothbrush (that needed disinfecting because Ezra decided to taunt him by brushing the toilet lid), the pencil from homework (who knows how that landed there), the water bottle from basketball practice, and a baby's mesh teething bag...I once again said in my heart, "I love my life". Because really, truly I do. I don't usually talk much about my company, Itty Smitty, on here. 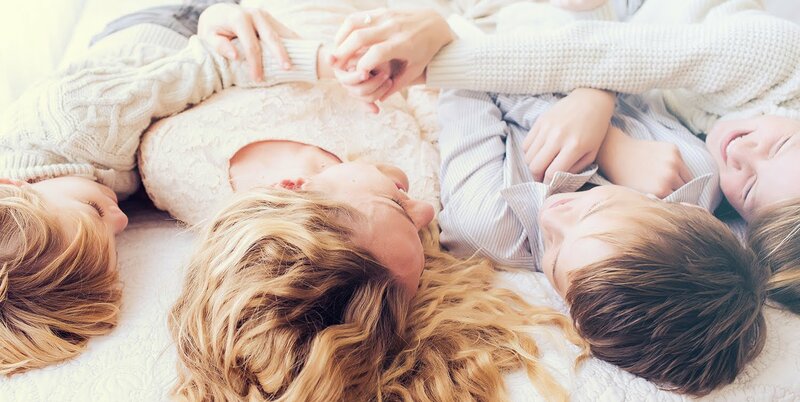 I prefer to keep it more about our family happenings. 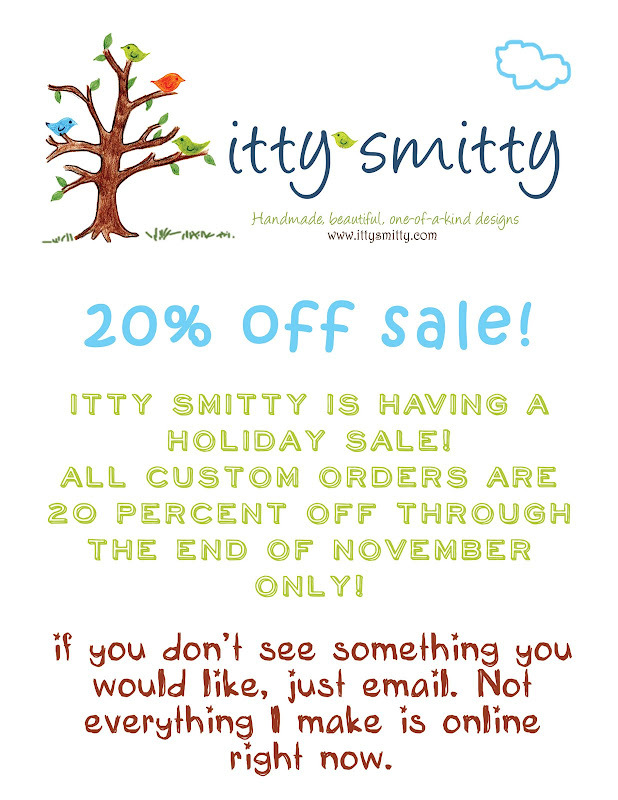 But since it is the time of year for gift giving, I thought I'd give everyone the heads up that Itty Smitty is having its annual 20% off holiday sale through the end of November. Everything is custom made so its a perfect opportunity to customize a gift for your friends, family and maybe even yourself! Use the promo code HOLIDAY at checkout. I woke up in the middle of the night with a terrible sore throat. I hate those nights. Every swallow hurts and there just isn't any relief...or sleep. I woke up Sunday morning tired, grouchy and achey. A bit of relaxed sewing in the morning didn't help so I headed in for a long (nearly 2 hour), hot bath. Some relief, finally. All day I was craving beef stew. Really, I just wanted the carrots out of the stew. But the process of stew making is still necessary to get those amazingly sweet carrots. And then while reading the French Women Don't Get Fat Cookbook I just had to have the Hot Cocoa Souffle along with the stewed carrots. Since our chef was off today (ha ha) and once I had it in my head to make these two things, there was nothing left to do but get in the kitchen and cook. I took a nap while the meat simmered and although making both the stew and souffle took much longer than my normal superwoman speed, I did have dinner on the table before 8pm. The stew recipe I make is similar to this one. And you can find the souffle recipe here. Knee deep in holiday fabric for Christmas orders. A tutorial I wrote for International Quilt Festival this month. Making some yummy praline sauce. Comforting a teething (and recent crawling) baby. Some photos of our afternoon at Granny's. A half hour from the closest store, a winding drive deep into the head of the holler. It's so...quiet. Nothing beats a gorgeous fall weekend at Roscoe's and Nan's deep in the mountains of eastern Kentucky. I just had to capture in photos how much Otto is growing up. I can't believe he can sit up and play with his brothers now. In the matter of a week he learned to sit up on his own, lay back down on his own and crawl. Let the baby proofing begin, once again. Mike and I also made it over to my favorite little shop tucked away on a mountain road. Its filled with so many goodies. I really just want to back up a U-haul truck to the door and unload her entire shop to bring home with me. But instead, I contained myself and brought home just a few vintage buttons, some glass pulls and some antique lace.